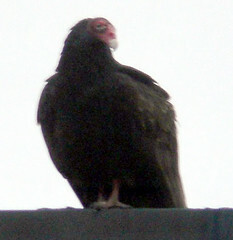 This is a photo of the turkey vulture that sits outside my window, perched at the top of my office building. I've named him Gus, mostly because that's a cool name for a turkey vulture. His lovely friend Constance is around too.. but I didn't get a pic of her. She was busy chasing down some dead meat for a snack.